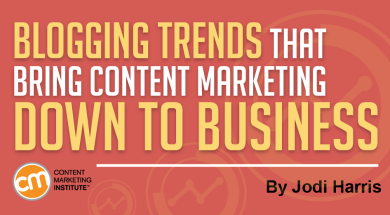 If you’ve seen any of CMI’s 2017 Benchmarks, Budgets, and Trends research, you may have noticed that the content marketing industry is growing up. In fact, 28% of B2B marketers, and 30% of B2C marketers now say their program has reached the sophisticated or mature stage of progress – the point where their efforts are able to provide measurable value to the business. Increasing sophistication with content doesn’t mean practitioners have outgrown the tools and techniques that helped them reach greater success. And, despite all the channels, formats, and digital innovations emerging in our industry over the last few years, one tried-and-true tactic, in particular, continues to lead the pack when it comes to reliably driving returns on the content investment: blogging. 80% of B2B marketers and 75% of B2C marketers include blogging among their current techniques. 52% of B2B and 51% of B2C marketers expect that blogging will be their most critical tactic for achieving success in the upcoming year. But just because blogging doesn’t seem to be losing its standing in the marketing mix doesn’t mean marketers’ preferred practices aren’t subject to shifts in media trends and consumption preferences. In fact, as the findings from Orbit Media’s third annual blogging trends survey reveal, some interesting changes are happening when it comes to content length, time spent creating posts, promotion efforts, and performance measurement. While Orbit Media Strategy Director Andy Crestodina’s own summary focuses on what’s changed over the past year, the results also reveal trends gradually gaining momentum. Below are some findings that we at CMI see as particularly noteworthy, along with some actions we suggest to help you take full advantage of this powerful content marketing channel. Key findings: The average blog post now takes over three hours to write (a 26% increase, year over year), and the number of bloggers who spend more than six hours on a post doubled in a year. Our perspective: Anyone can throw together some personal opinions or controversial remarks, toss in a few supporting stats or anecdotal examples, share it in a public forum, and call it a “blog post,” but that doesn’t mean it’s truthful, meaningful, or even valuable content (a hard lesson that Facebook is learning). Consumers want to trust their information sources and are increasingly expecting that content be rigorously researched, factually accurate, and worthy of their time and attention – meaning that it helps them make better decisions and confidently complete the tasks they need to get done. Though high-quality, highly detailed content can take more time and resources to produce than snackable, short-form blog posts, the extra effort is likely to pay off in terms of greater customer interest, awareness, and action over the long term. In fact, CMI’s 2017 research found that 53% of B2B practitioners who say they are achieving greater success now than in previous years attribute the increase to spending more time on content marketing. Our recommendation: Just because you recognize the value of publishing longer, more-detailed blog posts doesn’t make writing them any less intimidating – especially when you are staring at a bunch of blank pages that need to be filled and you are having trouble deciding on a topic. One way to reduce the stress that can paralyze your writing process is to focus on executing only the most meaningful ideas that enter your creative pipeline. You can use plenty of techniques to prioritize your post topics and avoid wasting energy on projects that will be difficult to bring to fruition, including this four-step process outlined by CMI’s Michele Linn. Key findings: The majority of bloggers get a second set of eyes on their posts, and approximately one in four works with an editor to help maintain optimal quality and production standards. Our perspective: In addition to meatier, more detailed posts, the Orbit survey reveals an increasing reliance on more formalized editorial processes – including collaborating with professional editors – to set and maintain high quality standards for blog content. Why is setting a high bar for editorial quality so important? To paraphrase the advice offered by Robert Rose in CMI’s 2017 Content Marketing Framework, content marketing works best when it’s viewed as a sustainable ongoing operation – not just a series of unrelated, ad hoc campaigns. An established editorial process is part and parcel to planning for your blog’s long-term success, which includes putting the right team resources and production procedures in place to consistently deliver the standout content experiences that audiences truly crave. Our recommendation: Whether you work with professional editors or simply rely on the eagle eyes of your blog writers, a clearly defined workflow will help your content team members properly focus on each task they oversee, and give them confidence that their efforts are contributing to your organization’s goals for content quality and value. Need some help getting started? Here’s a step-by-step guide to defining your content workflow. Key findings: The vast majority of bloggers include at least one image in their posts, and 15% are including video. More specifically, over 35% of those who reported “strong” results include video in their blog content. Our perspective: It’s no surprise that bloggers are increasingly relying on visuals and other multimedia content formats to engage audiences. Not only do images help make text-centric content more readable, digestible, and memorable, but they can be used to craft compelling messages that speak volumes without using a single word (just ask anyone who has posted an expressive selfie on Instagram). Beyond engagement, strategic use of visual content can also increase dwell time, make your content more shareable, and drive a more positive brand perception – all of which can provide a much-needed boost in your marketing performance. What is our clearly defined vision of who we are and what makes us unique? How can we communicate those messages in a visually compelling way? For which terms do we want our images to rank on search engines? Key findings: Virtually all bloggers (more than 95%) say they promote their blog posts on social media. Orbit’s survey also found a 60% increase in the number of bloggers promoting their content via email and a three-fold increase in the number using paid promotion to boost blog traffic over the last two years. Our perspective: You worked hard to produce your content and make it valuable to your audience. Why wouldn’t you devote the same time and attention to making sure it gets into their hands? Considering how crowded and noisy the content landscape is these days, it’s no surprise that the vast majority of survey respondents use social media to talk up their latest posts – it’s free and easy to do. But with organic reach said to be declining on networks like Facebook, results-oriented brands are increasingly turning to powerful techniques like email campaigns, SMS messaging, native advertising, and even paid ads to give their posts a much-needed promotional push to the top of the pile. Our recommendation: In terms of visibility, credibility, and impact, few content promotion techniques rival the persuasive power of collaborating with known industry influencers who are eager to share their passion for your brand. These influential voices typically have an established audience who are receptive to their ideas and recommendations. Not only are they well positioned to amplify your brand’s overall reach and awareness, they can also lend much-needed credibility to a particular piece of content by endorsing it to their networks of followers. If you are looking to increase your blog content’s ability to draw the right audience, here’s an eight-step influencer marketing process that will walk you through everything. Key findings: Though the majority of bloggers still don’t check analytics for every post, the number of bloggers who do has increased by 18% over the last three years. In addition, 30% of bloggers who usually or always check their analytics report “strong results” from their blog compared to 18% of bloggers who don’t check analytics. Our perspective: While measurement is often thought of as the final step in the blogging process (if it’s even thought about at all), measurement should factor into all stages of your content marketing approach – from planning to prioritizing, publishing, promoting, and beyond. This is especially true when it comes to blog posts, as they often serve as the anchor of a business’s content program. If you don’t have the right evaluation processes from the start, you will never truly know whether your posts are meeting the needs of your audience or identify what course corrections you might need to keep your performance results aligned with your business goals. Our recommendation: Of course, just because you can measure just about anything these days, doesn’t mean that you should. Metrics can be all-consuming and confusing. It’s often best to focus on high-priority KPIs (key performance indicators) first, then incorporate additional data points (or implement more sophisticated analytics processes) once you’ve established a solid baseline for gauging ongoing success. For help getting started, use the template provided by CMI’s Michele Linn in her post on how to simplify your editorial reporting. Did you find any of the results of Orbit Media’s survey to be surprising? What other techniques would you recommend to optimize the value of your blog content? Let us know in the comments.